Despite of complex parentage, this hybrid has yield high germination. First one to bloom is red color on a small plant. A little background; this was a select seedling I purchased from Terry at Pine Ridge orchids in 2009. It was his largest and most robust from the original cross from the Nortons. It is a great breeder and gives tons of seed and for me has grown many vigorous seedlings. It imparts all shades of dark yellow/orange/red from the Krull's Red Hot and Katie Morris background. 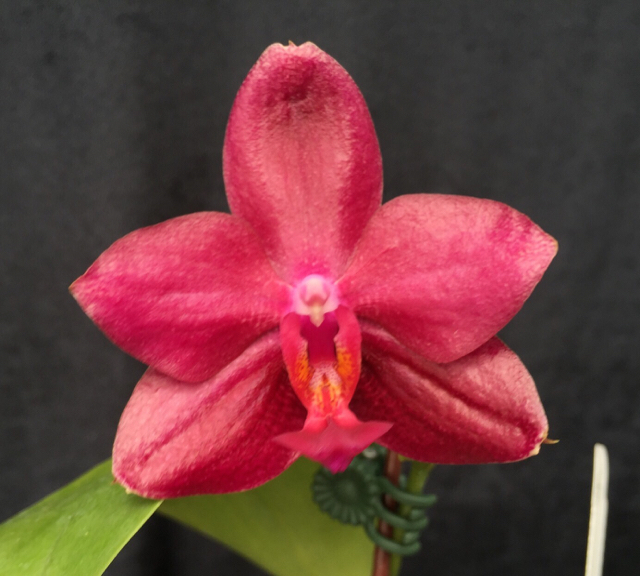 The color of this first bloom seedling is great - I expect far superior seedlings (shape) to come from this cross, with lots of interesting color variation from both parents. Thank you Mark. This cross was made in 2013. With so much going on, 3 years ago seems like a long time to me. My first bloom plant is small - I hope to bloom more from this hybrid. I did not get to smell this flower before it was wilted. I hope it is because pollen parent is fragrant. 2015 flasks. By now the media must be pretty dried up. Last edited by sharky on Tue Aug 23, 2016 11:26 am, edited 1 time in total. Ha! I start feeling an urgency when some of the leaves start to turn yellow. What a nice red one! As expected my plants from the flask I shared with you took longer to bloom because of my growing conditions. Most will not bloom until next year, but this example is the first to open on a very vigorous plant. The actual color, which is perfectly uniform is a slightly darker raspberry very difficult to photograph, but this is close. The flower is very large, more than 6 centimeters across, with a different petal shape to Pylo's Red. It is very shiny and waxy, but so heavy the stem cannot hold it upright. Only a very slight fragrance, but temperatures are unusually low here and my growing area is only in the low 70s...maybe when the weather warms up. I like the ridged pattern and color. Maybe I will bloom one someday, but mine are terribly neglected. but mine are terribly neglected. You and me both. The seedlings I kept were doing well then I got busy. It is all a question of temperature! In last couple of days my growing temperatures have touched 80 and my example of this cross, as shown earlier by Peter Lin has a rich but not particularly strong fragrance. For that you need Java Gem which is almost overwhelmingly fragrant. Here's is a second to flower from the same flask. A little different, but the red parent seems to have the upper hand again. I like them both but still have a few left to flower next year; hopefully they will show more of the other parent. oldphals - Thank you for sharing. It has good color.